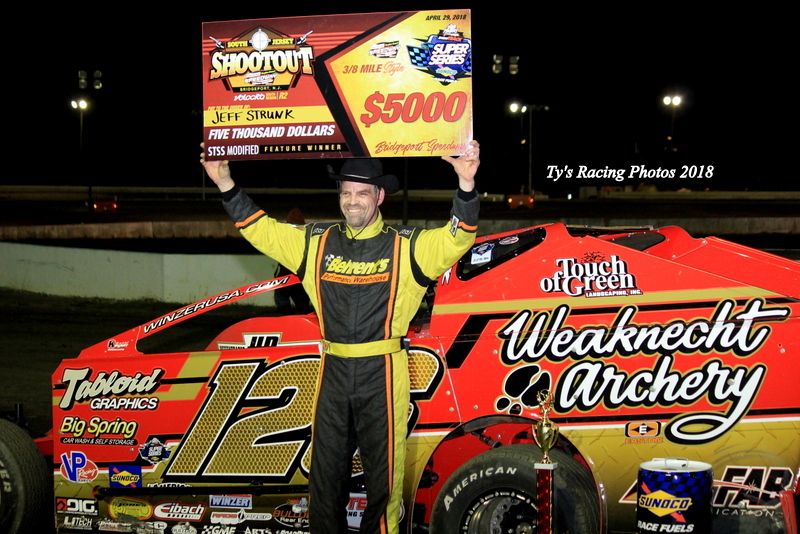 BRIDGEPORT, NJ – Finally, Jeff Strunk is a Short Track Super Series winner. Strunk, of Boyertown, Pa., etched his name on the Bob Hilbert Sportswear Short Track Super Series (STSS) Fueled By Sunoco winner’s list on Sunday night on the all-new Design for Vision/Sunglass Central three-eighths-mile oval at Bridgeport Speedway. Driving Glenn Hyneman’s Keystone Racing No. 126 with spec small-block power, Strunk dominated the day’s events, launching off the pole via a pre-race redraw of top qualifiers and leading all of the 40 laps. Strunk earned $5,000 for his victory and an additional $100 from Beyea Headers for turning the day’s fastest lap in timed warm-ups. “I’ve been trying for a long time to win one of these races,” offered Strunk, who became the 23rd different winner in 51 STSS events contested since BD Motorsports Media LLC formed the series in 2014. A field of 46 STSS Modifieds signed in for the second round of the STSS South Region and the first-ever series visit to the new three-eighths-mile oval at Bridgeport. Strunk drew the pole during a fan meet and greet behind the grandstands moments before the 40-lap main reached starter Warren Alston’s green flag. Strunk immediately drew away from New York State invader Danny Creeden, who settled into second. The first 10 laps spun off caution-free before disaster struck at the exit of turn two. Frank Cozze, who had been rim-riding on the outside lane from his sixth starting position, and Creeden met at the exit of turn two. Cozze’s No. 401 shot off the track and made contact with a tire marker, drawing the red. Initially shaken, the Wind Gap, Pa., driver walked away. On the restart, the inside lane jammed up and caused a multi-car tangle that saw Jared Umbenhauer on his side. A second red and short clean-up ensued. When green-flag racing resumed, Strunk again motored away from Creeden, who now felt pressure from Matt Sheppard in the Hurlock Auto & Speed No. 9s. Sheppard ultimately cleared Creeden entering the race’s final quarter, but was more than a straightaway behind Strunk, who was negotiating lapped traffic. The race’s final yellow flew on lap 36 for a flat tire on Creeden’s car. Strunk knew he had company on the restart in the form of Sheppard and 10th-starter Stewart Friesen, who had dropped deep in the field early and rallied back in the Halmar International No. 44. Strunk is now two-for-two on the new three-eighths-mile oval at Bridgeport. Sheppard scored his second runner-up finish in a pair of STSS starts for the Hurlock, Md.-based Hurlock Auto & Speed Supply team. He opened the South Region at Delaware’s Georgetown Speedway in March placing runner-up to Ryan Watt. Friesen, of Sprakers, N.Y., completed the podium in third spot, followed by Sheffield, Mass., driver Andy Bachetti, who started 11th and Montgomery, N.Y., driver Anthony Perrego, who rolled off eighth in Brian Smith’s No. 44 before getting shuffled back in the early laps and recovering for fifth. Finishing sixth through 10th, respectively, were Ryan Godown of Ringoes, N.J., who switched to a back-up spec engine car after track-run-in; Rick Laubach of Hellertown, Pa., driving Ryan Kerr’s No. 1K; Duane Howard of Oley, Pa., in the Norm Hansell-owned No. 357; Billy Pauch Jr. of Milford, N.J., who started 20th in Daniel Sommeling’s No. 51; and David Van Horn Jr. of Harmony, N.J., who rolled off 16th in Fred Vahlsing’s No. 323ov. Strunk set the fastest lap during timed warm-ups and earned $100 from Beyea Headers. Heat winners were Creeden, Perrego, Von Dohren, Friesen and Richie Pratt Jr. Consolation victors were Van Horn, Neal Williams and Jared Umbenhauer. Tom Collins Jr. of Lansing, N.Y., made the long tow to South Jersey for Round No. 2 of the STSS Crate 602 Sportsman South Region. His haul was rewarded with a $1,000 victory in the 20-lap event. Collins had run on the Bridgeport five-eighths-mile before, but had not laid eyes on the three-eighths-mile until Sunday morning. However, he took an immediate liking to the venue and led from start-to-finish in the 20-lap main impressively, opening up a lead of more than a full straightaway at times. Another Empire State driver – Cory Cormier of Otisville, N.Y. – chased Collins to the stripe, finishing second. Rick Wegner Jr. made a ‘game-day’ decision to compete on Sunday and ended up a solid third, followed by Pennsylvania teenager Dylan Swinehart and Scott Kohler. A field of 37 STSS Crate 602 Sportsman took part in the program. Heat winners were Cormier, Jeremy Harrington, Wegner and David Schilling. Consolations went to Adam McAuliffe and Eric Kormann. Jeramy Doerr won the accompanying 15-lap Outlaw Stock feature. BRIDGEPORT BITS: With the three-eighths-mile in operation for only the second time since its construction, the turn-one pit area was utilized to bring fans closer to the action and allow crew members to watch from the main grandstand with a clear view…. Bridgeport track champion Ryan Watt received Hard Charger distinction after taking a provisional and driving forward from 25th starting position to finish 11th in the Ron Roberts-owned small-block. Watt picked up $200 from Precision Hydraulic & Oil’s Joe Infante, a $200 Beyea Headers certificate, and $50 toward the purchase of Vahlco Wheels…. Tough break for Delaware’s Jordan Watson, who showed speed early in the program before suffering terminal engine woes during his heat-race program…. The ‘South Jersey Shootout’ STSS Modified field grew from a year ago to a solid 46 cars from across the Mid-Atlantic and Northeast…. 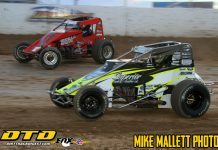 Up next for the STSS is the ‘Hard Clay Open’ on Tuesday, May 8 at N.Y.’s Orange County Fair Speedway to kick off the Halmar International North Region with a 50-lap main event paying $5,000 to win and $500 just to take the green flag. The Orange County Sportsman division will be on the docket as well with a $1,000-to-win 20-lap main. The STSS Velocita-USA South Region heads to Delaware International Speedway in Delmar, Del., on Thursday, May 24 with the ‘Diamond State 50’ offering $5,000 to win plus the STSS Crate 602 Sportsman ($1,000 to win) and Delaware Super Trucks. Bob Hilbert Sportswear Short Track Super Series Fueled By Sunoco Velocita-USA South Region Event No. 2 Modified Feature Finish (40 laps): JEFF STRUNK, Matt Sheppard, Stewart Friesen, Andy Bachetti, Anthony Perrego, Ryan Godown, Rick Laubach, Duane Howard, Billy Pauch Jr., David Van Horn Jr., Ryan Watt, Brian Krummel, Craig Von Dohren, Mike Gular, Danny Creeden, Jimmy Horton, Danny Bouc, Neal Williams, Dillon Steuer, Matt Stangle, Brett Kressley, Joseph Watson, Dave Hunt, Frank Cozze, Richie Pratt Jr., Billy Pauch Sr., Jared Umbenhauer, Billy Decker. Did Not Qualify: Rocco Infante, Jim Britt, Ryan Krachun, Doug Manmiller, Tyler Boniface, Michael White, Kevin Vaclavicek, Wade Hendrickson, Chris Grbac, Tommy Beamer, Justin Grim, Ron Roberts, Steve Young, Jordan Watson, Bob Sarkisian, Roger Manning, Brandon Grosso, Sam Martz. Beyea Custom Headers Heat Winners ($50 Certificates): Danny Creeden, Anthony Perrego, Craig Von Dohren, Stewart Friesen & Richie Pratt Jr.
Bob Hilbert Sportswear Short Track Super Series Fueled By Sunoco South Region Crate 602 Sportsman Event No. 2 Feature Finish (20 laps): TOM COLLINS, Corey Cormier, Rick Wegner Jr., Dylan Swinehart, Scott Kohler, Jim Housworth, Stephen Kemery, Tommy Scheetz, Sammy Martz Jr., Adam McAuliffe, Seth Spayd, Frank Dorry, Eric Kormann, Joe Toth, Jeremy Harrington, Brad Roberts, David Crossman, Bobby DeLeon, Connor Otten, Andrew Kreis, David Schilling, Shayne Spoonhower, Tom Moore Jr., Parker Guldin, Ryan Simmons, Dan Fleming, Wayne Weaver, Joseph Brown. Did Not Qualify: John Criscione, Thomas Sherby, Alonzo Morales, Pete Serra, Kevin Borden, Adam White, Chris Brennan, Jim Gallagher Jr., Tom Princiotta. Outlaw Stock Feature Finish (15 laps): JERAMY DOERR, Tom Wills Jr., Spider Ensinger, Mike Creamer, Billy Wroble, Lee Allen, Brian Ludwig, Gary Klimeczek, Keith McKinley, Rich Stanton, David Kramer, Scott Hulmes.